namaḥ (n/V) – adoration, homage; kanaka (n)– gold; nīlābja (n) – blue water lily; pāṇi (m) – the hand; padma (n) – a lotus; vibhūṣite (f/V) – adorned, decorated; dāna (n) – giving; vīrya (n) – striving; tapas (n) – austerity; śānti (f) – tranquillity, peace; titikṣā (f) – endurance, forbearance, patience; dhyāna (n) – meditation; gocare (f/V) – range, abiding in, object of sense. diligence, austerity, tranquillity, patience and meditation. The third praise is to Sonam Thobkyedma,Tib the “Yellow Lady of Good Fortune”. She is beautiful; her skin is the color of pure gold glittering in the early morning sun. Her left hand is adorned with a blue lotus, upon which sits a gem that bestows all wishes. She is the lord of the Bodhisattvas’1 sphere of activity, which encompasses the transcendent perfections of generosity, patience, diligence, ethics, tranquility, wisdom, and meditation. Austerity, (in this context) is ethics, and tranquility is wisdom and meditation. We pay homage to the unchallengeable lady who has the ten powers: the power over life, the power over mind, the power over wealth, the power over action, the power over birth, the power over inclination, the power over aspiration, the power over miracles, the power over primordial wisdom, and the power over dharma. The outer meaning is that she has attained the completion of the six perfections, in just one meditation. The inner meaning is that her singular meditation is like a lotus, free from the flaw of adherence to subject and object, and is endowed with the completion of the six perfections. 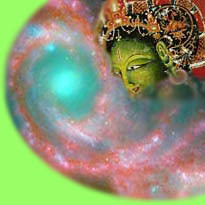 1 Bodhisattva skt ~ One who has generated bodhicitta skt and seeks enlightenment for the benefit of others.